Carrot cake is an all time favourite at home. 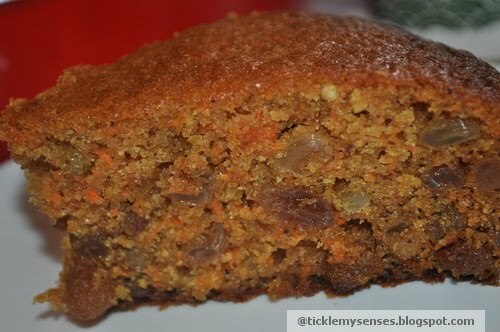 Not only does the carrots make this cake healthy and super moist, the wheat flour makes it light. The juicy plump raisins adds to the texture. 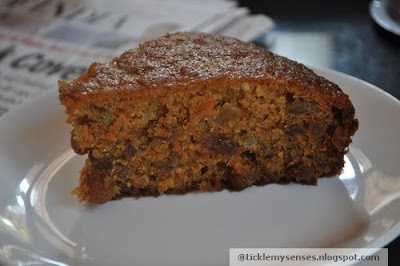 The orange rind adds a wonderful aromatic flavour which makes this version special. Carrots are a good source of of Vitamin A, Calcium, Phosphorus, Magnesium and Vitamin E. Hence is well known for its remarkable ability to promote good eye sight, provides natural protection from arthritis, helps to maintain a healthy nervous system and strong bones. Thankyou Marylene for this wonderful recipe. Preheat oven 180°C / Gas Mark 4/ Fan 160°C. Oil and line base of 25cm round cake tin. Take sugar in a large mixing bowl add eggs mix well using a wooden spoon. Add oil and lightly beat till sugar well dissolved. Add grated carrots, raisins and orange rind. Sieve together flour, bicarb and spices, and add in increments into the egg mixture. Mix well. Mixture will be soft and runny. 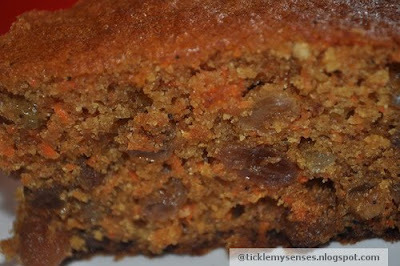 Pour mixture in tin and bake 40 – 45 minutes. Centre will feel firm and springy. Cool in tin 5 minutes, turn out and peel off paper and cool. 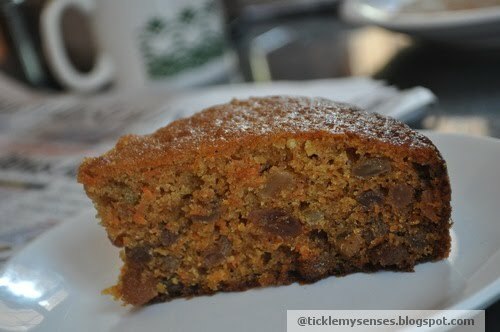 Serve a large slice at tea time with a hot cup of coffee/ tea or as a dessert alongside a scoop of vanilla ice- cream.